The Square to Linear Feet tool makes it a snap to convert between square feet and linear feet of board, tile, etc. required for an area. 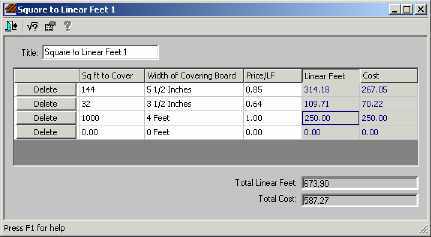 For example, when covering a floor area with hardwood or tile, or placing a wood ceiling, wains coating, siding, or decking, the accuracy of the Square to Linear Feet tool will save you time and headaches.